The new MediaLab, located in the Music & Media Library on the fourth floor above the entrance in the Woodruff Library, provides specialized software for audio and video editing, graphic design, and web development software and hardware to create multimedia projects. Student Digital Life is debuting new services and spaces for the 2015-16 academic year that will expand opportunities for learning and creativity and increase options for studying and collaboration. “Many of these changes have come from student feedback,” says Tony Shiver, Student Digital Life manager. Shiver and his team review responses from the annual technology and library surveys, as well as how-to questions the students bring to the SDL service desk. Faculty and staff can also use EaglePrint. Users can find printer locations and more information on the EaglePrint webpage. In the newly constructed MediaLab, students can use a variety of video, graphic design, audio and web development software and hardware to create multimedia projects. The lab is conveniently located in the Music & Media Library on the fourth floor at the front of Woodruff Library, where students can check out video and still cameras, tripods, microphones and other filming equipment. MediaLab will be equipped with industry-leading tools and services; 18 workstations will give students access to specialized software such as Final Cut Pro, professional versions of Photoshop and Premiere, Dreamweaver, Illustrator, InDesign and other software. The Lynda.com stations, which offer free video tutorials on various software programs through the library’s licensing agreement, will also move into the MediaLab space from their current location on Level 2 in the Learning Commons. Student Technology Support (STS) is a free service for Emory students, providing technical support and assistance for a variety of issues on student-owned devices, including EmoryUnplugged wireless setup and game console registration. For serious problems, students can check in their computers for virus or spyware removal. STS will move from the Computing Center at Cox Hall to Woodruff Library Level 1, just past Peet’s Coffee and Tea. 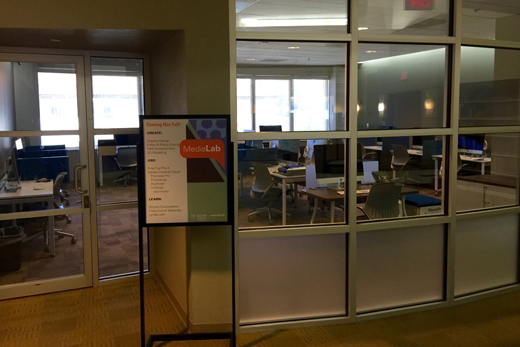 Located in the Computing Center at Cox Hall, TechLab serves as a research and development space, where new and emerging technologies are evaluated for use in academic life. The lab includes 3-D printing and scanning, and will soon support makerspace activities that allow students to create projects using tools to which they normally may not have access. TechLab, which opened in January and has served about 200 people so far, has created a wide variety of fascinating objects relating to anatomy and biology, art history and architecture, among other subjects. Although TechLab is run by Student Digital Life, this service isn’t just for students; faculty members and instructors are also encouraged to come up with projects that make use of the 3-D printing resources. For more information on all of Student Digital Life’s services, spaces and support, visit http://it.emory.edu/studentdigitallife. Student Digital Life, along with Emory Libraries, is part of Library and Information Technology Services (LITS) at Emory University.